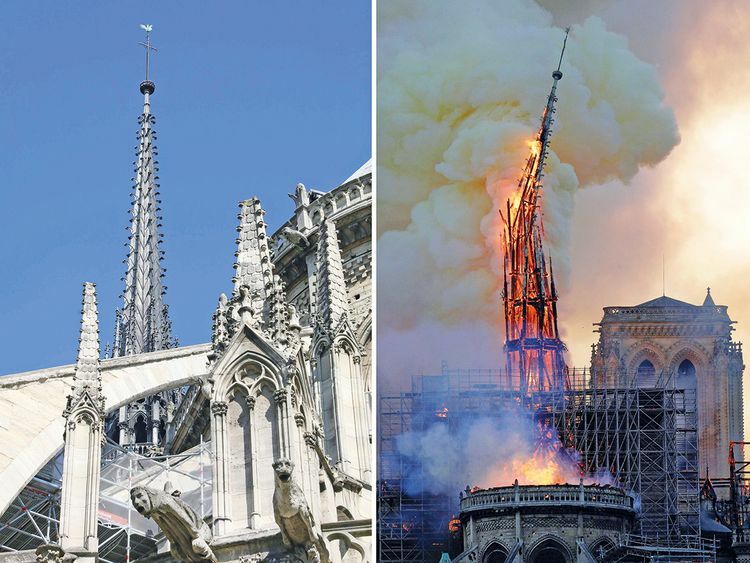 Paris: France will invite architects from around the world to submit designs for rebuilding the spire of Notre-Dame cathedral that was destroyed in a devastating blaze, Prime Minister Edouard Philippe said Wednesday. The goal is "to give Notre-Dame a new spire that is adapted to the techniques and the challenges of our era," Philippe said at a press conference in Paris. Meanwhile, reports say nearly $1 billion has already poured in from ordinary worshippers and high-powered magnates around the world to restore the fire-ravaged Notre Dame Cathedral in Paris, after the French president set a controversial five-year deadline to get the work done. Construction teams brought in a huge crane and a delivery of planks of wood to the site Wednesday morning. Firefighters are still examining damage and shoring up the structure after Monday's fire collapsed the cathedral's spire and destroyed the roof. Presidential cultural heritage envoy Stephane Bern told broadcaster France-Info on Wednesday that 880 million euros ($995 million) has been raised in just a day and a half since the fire. Contributions came from near and far, rich and poor - from Apple and magnates who own L'Oreal, Chanel and Dior, to Catholic parishioners and others from small towns and cities around France and the world. Meanwhile Macron's 5-year deadline - which happens to coincide with the 2024 Paris Olympics, which the government wants to make a major showcase - struck many as unrealistic. Some 30 people have already been questioned in the investigation, which the Paris prosecutor warned would be "long and complex." Among those questioned are workers at the five construction companies involved in work renovating the church spire and roof that had been under way when the fire broke out.